Thirty seven people from around the world were selected by the Obama Foundation to study in the US. In addition to their academic studies, they’ll also receive leadership training to prepare them to take on big issues back home. Their first lesson begins on the South Side of Chicago. 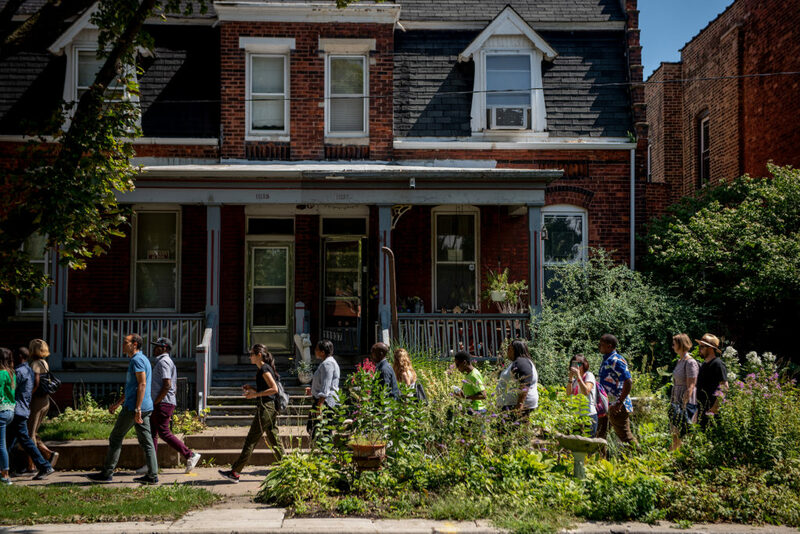 We follow the Obama Scholars as they learn about the history of the South Side—both the distant past and the recent present. As President Obama wrapped up his recent surprise visit to a group of Foundation supporters and stakeholders, he spotted a familiar face in the crowd. “I see you, Reverend Love,” he said, his finger pointing into the crowd. Though the President had finished his remarks and received a round of sustained applause and though his day was far from over and the motorcade was awaiting him downstairs, he couldn’t resist telling one more story. He seemed like a man who wasn’t quite ready to leave home. Then came the punchline. “I know, later, from interviews that he’s done, that [the Reverend] thought: This guy is too young and has no idea what he’s doing!” The room broke out into knowing laughter. 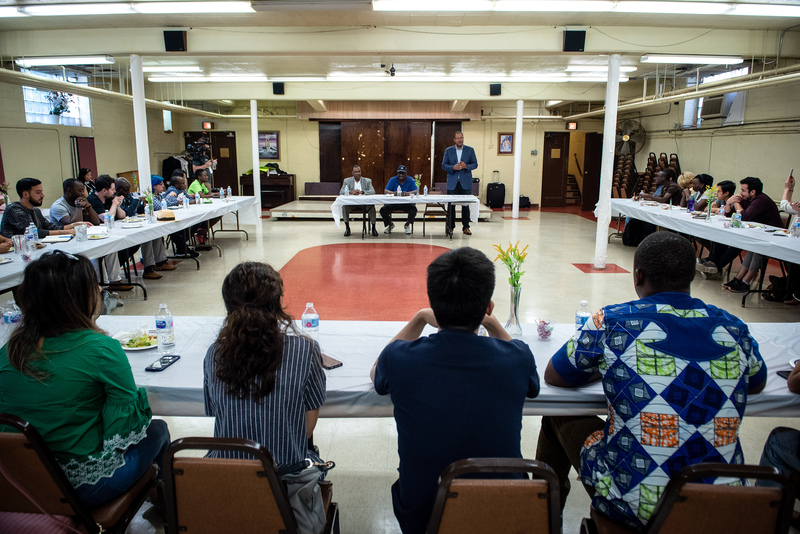 A couple of days later, the Obama Foundation Scholars—37 emerging leaders from around the world who have traveled to America to take their next step in their education — heard it straight from the source. 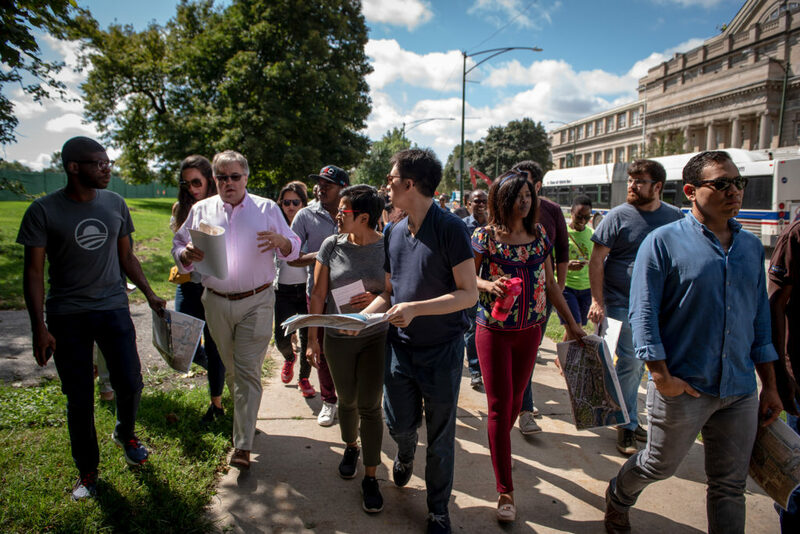 That story was revealed to them during their third stop on an intimate tour of Chicago’s South Side, the neighborhood that played such a formative role in Barack Obama’s life. 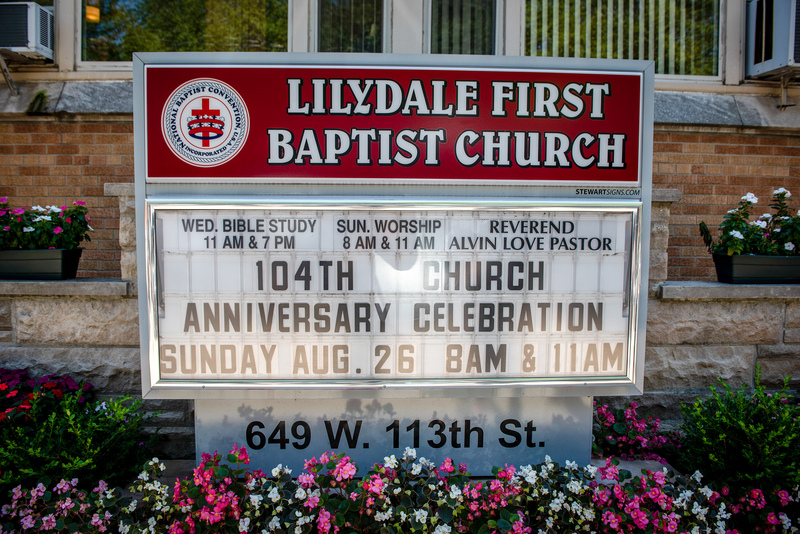 They had just settled into the basement of Lilydale First Baptist, a modest brick church in the Roseland neighborhood, when Reverend Alvin Love shared his less flattering version of the story. Don't miss any updates from the Obama Foundation. That inside story was a highlight from a day that began much earlier, over breakfast at Valois diner, a Hyde Park institution just across a narrow alley from the Foundation’s headquarters. Long a stomping ground of the President’s during his professorial days, Valois has a menu of his favorite orders hanging on the wall (steak and eggs are at the top of the list). Though the Scholars had come from places as far flung as Cameroon, India and Vietnam, they blended into Valois’ South Side crowd, a mix of police officers in uniform, professors in blazers and a stream of regulars whose orders were prepped as soon as they were spotted in line. After breakfast, the Scholars boarded a charter bus bound for Jackson Park, the future site of the Obama Presidential Center. 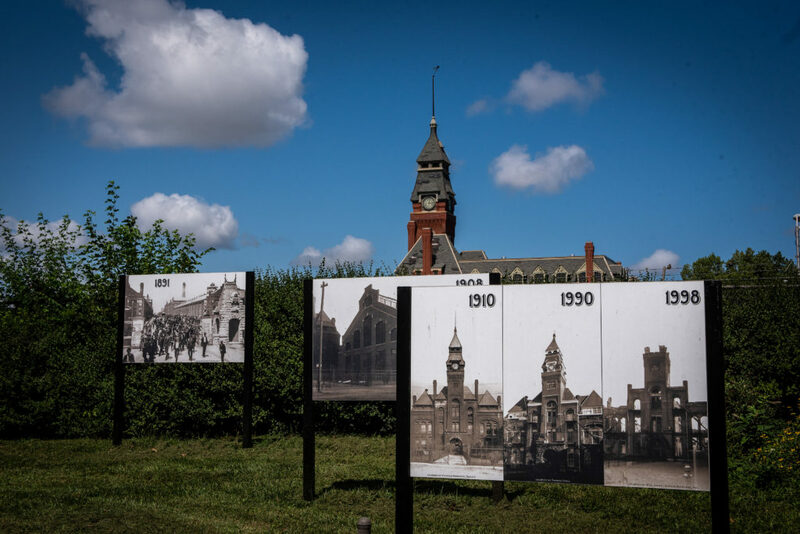 If you’ve heard of Jackson Park—and you don’t live in Chicago—it’s likely because it was the site of the 1893 World’s Fair, an event memorialized by Erik Larson’s bestseller, The Devil In the White City. 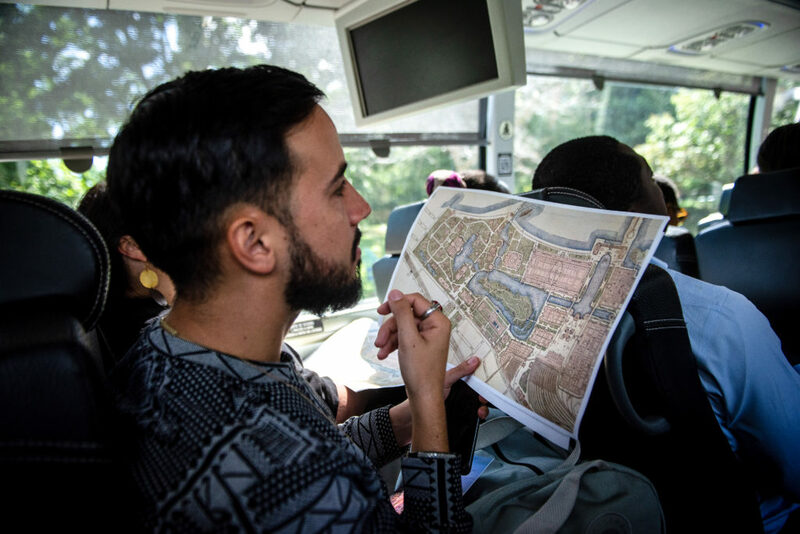 Before we arrived, Chris Wilson, Director of Planning and Design for the Museum Team, handed out a series of topographical maps to the Scholars. The first page was a historical map of the Fair, laid out against the massive scale of the park. It was dotted with train tracks, carriage paths, and massive buildings, with waterways flowing throughout. The second page was a satellite image of the park as it is today, its interior interrupted by thoroughfares and car traffic. Though fewer buildings sit atop the park today than during the Fair, it’s easy to spot the outlines of baseball diamonds and running tracks, and even some tennis and basketball courts on its east side, where it borders Lake Michigan. The final page represented where the completed Center might sit on that satellite image, its campus reconnecting the park’s west edge with its interior lagoons, so that one could cross the park from edge-to-edge, without fear of crossing six lanes of car traffic. As Chris walked us through the maps, our bus came to a stop on Stony Island Avenue on the western lip of Jackson Park. After several days of unrelenting humidity, the Chicago summer had calmed into something pleasant, and rather than rush for shade, the Scholars disembarked into the sun. Despite the park-perfect weather, though, few people were out enjoying the space. Whenever traffic died down on Stony Island, the only sounds of summer were the cicadas in the trees. Chris began walking us through the park, explaining the history of its development. After the Great Chicago Fire of 1871, the state legislature had commissioned Frederick Law Olmsted and Calvert Vaux—the landscape architects behind New York’s Central Park—to design a massive public space called South Park. 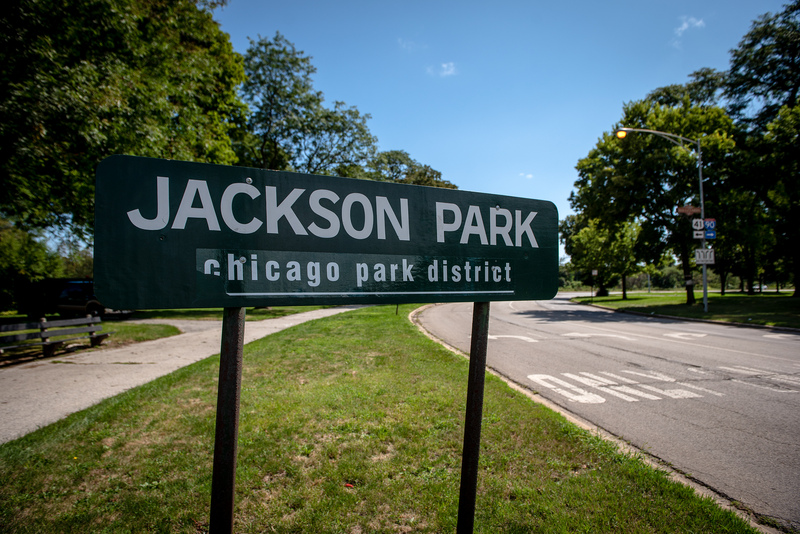 South Park would actually contain two parks, what are today Chicago’s Jackson and Washington Parks, connected by a wide boulevard, the Midway Plaisance. 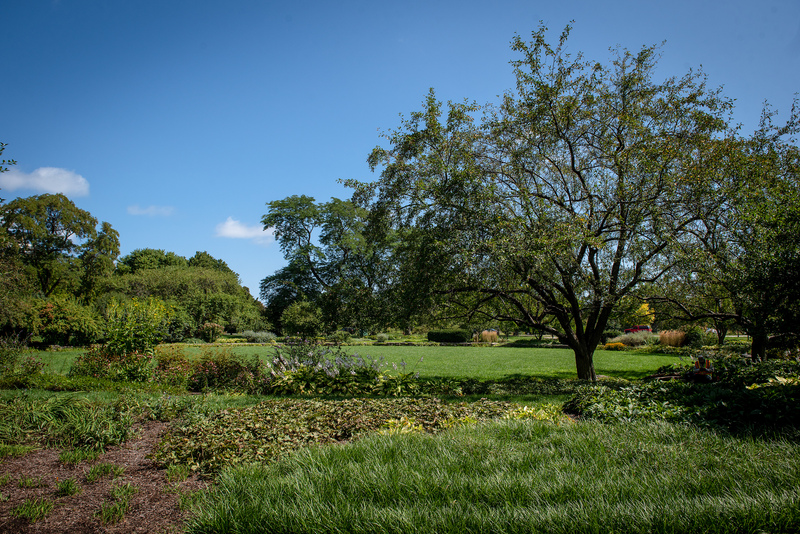 Olmsted’s original vision for Jackson Park wasn’t realized until years later, when Chicago was chosen as the site of the World’s Fair in 1893. The Fair was planned to commemorate the 400th anniversary of Columbus’ discovery of the New World and Chicago’s selection was a demonstration to the world that the city had risen from the ashes of the 1871 fire. Olmsted helped design the massive neoclassical “White City” that would serve as the Fair’s headquarters. The only building still left from the White City was the Palace of Fine Arts, now home to the Museum of Science and Industry. Although the rest of the Fair’s buildings were built with temporary materials and clad with a combination of plaster of Paris, glue, and hemp, the Palace of Fine Arts was built with masonry and steel to protect the artwork that would be housed there. It was a testament to the fact the city had literally been burnt before. As Chris walked us east of 62nd St toward Cornell Drive, the six-lane thoroughfare that was paved through the park during the ‘50s and ‘60s, he tried to explain the sheer size of the Fair. Anyone who has been to Chicago’s Museum of Science and Industry knows how large the 400,000 square foot building can feel; it’s a place where afternoons disappear. Looking at the map Chris handed out, the Manufacturer’s Building at the South East end of Jackson Park was more than three times as large, at nearly 1.3 million square feet. At the time of the Fair, it was the largest building in the world, its footprint more than twice the size of the Great Pyramid in Giza. All told, some 12 million people made their way to Jackson Park during the Fair. At the time that was just under one-fifth of the total U.S. population. On its busiest day, over 700,000 people attended, more than ten times the capacity of Soldier Field. That day, that version of Chicago was almost impossible to imagine. Playgrounds in the park were empty and the few children who were playing catch on the neighborhood track were far outnumbered by flocks of geese. As Chris guided the Scholars through the park, drivers on Stony Island craned their necks and looked on with puzzled looks. Why is someone giving a tour there? What is there to see? Chris walked the group up to a small clearing, a large architectural rendering rolled up in his hand. The sun tracked through the clouds and filtered through the leaves as he began to unfurl the drawing in his hand with help from another member of the Foundation’s staff. “You’d probably have to stand a little farther back in the street to get this exact view,” Chris said. The view was of the base of the Obama Presidential Museum, an eight-story tower that would celebrate the President’s legacy and serve as the focal point for the center. Though other cities contended for the Center—Honolulu, New York, even other sites in Chicago—the President has talked about how important it was to be built in the South Side, within walking distance of where he began his career and his family. The rendering depicted several tall trees, the obvious footprint of a museum building, and an additional forum building that would house an auditorium for programming. But even all those elements weren’t as difficult to imagine in that space as the people in the rendering, hundreds of them walking through the campus of the new Center. Chris explained the plans for the Museum and the Center, about the effort to replant and restore trees that would have to be relocated. He talked about turning Cornell Drive back into a pedestrian walkway, fulfilling Olmsted’s original vision of a water-filled, accessible public space. He talked about how, even with the Center’s buildings, the project would recreate more parkland than it would occupy. He talked about working with local residents to ensure the development was built “with the people, not for the people.” And he talked about families coming back again to the park, to enjoy a public space on the South Side of Chicago as vibrant as those on the North. It’s difficult, without setting foot in Jackson Park, to appreciate the ambitions that have been a part of its history. That’s true when trying to understand the scale and scope of the World’s Fair, the massive human footprint it entertained. But it’s also true now, seeing a place that once was vibrant and grand and the center of the world’s attention, now sit dormant and disconnected, and to imagine, as Chris did, a more hopeful future for it. All aboard the bus again, the Scholars were bound for Pullman, a historical neighborhood in Chicago about eight miles South of Jackson Park. 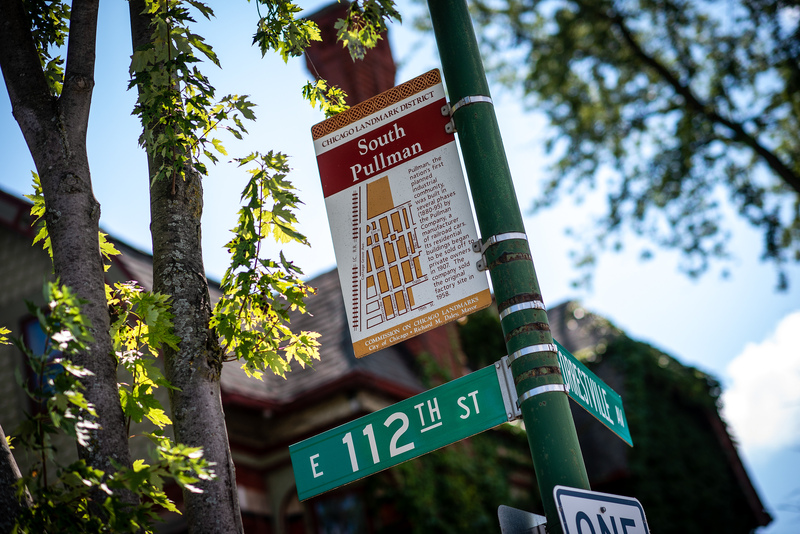 Dedicated a National Monument by President Obama in 2015—Chicago’s first—Pullman was one of America’s first company towns, built in the 1880s by George Pullman to house workers of his railcar factory. In the years between the Fire and the Fair, the population of Chicago had exploded from 300,000 to over one million and the sudden boom left workers with squalid living conditions. George Pullman built his eponymous town to give his workers a better living environment that was closer to their jobs, though he would exert an almost paternalistic control over their lives in exchange. Visitors to Pullman don’t need to imagine the history of the site the way you do with the World’s Fair; much of it is still there for you to see. A large public square is ringed by hundred-year-old Victorian brick row houses, built by the company to house executives and doctors that worked for the company. One of the largest buildings on the site is an antique hotel, the Hotel Florence, which once served visiting businessman but was prohibited for Pullman workers. And just a little bit further off in the distance are the remnants of the original Pullman factory, much of it reconstructed since an arsonist set fire to the site in 1998. The Scholars were given a brief history of Pullman by a member of the National Park Service, who detailed the company’s long and fractured history with the emerging labor movements in post-Civil War America, most notably the bitter Pullman strike. Though the strike would grow to become a national crisis, its origins were inseparable from the town. 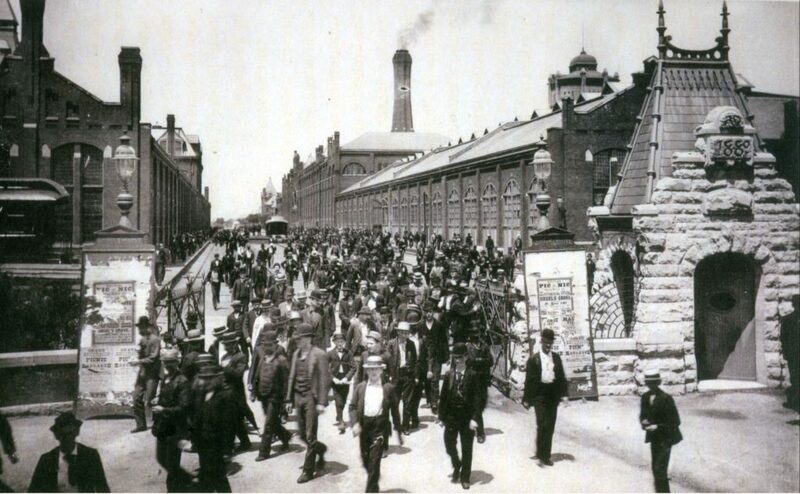 During a sharp economic downturn in the late 19th century, the Pullman company reduced the wages and hours of its factory workers, but refused to reduce their rents in the town. When the downturn began, Pullman’s workers were not unionized. The membership of the only existing railroad union, the American Railway Union, was formed by labor leader Eugene V. Debs to organize unskilled rail workers, not skilled railcar manufacturers. As conflict brewed between the company and its town’s residents, Debs traveled to Pullman, ultimately signing up many of the disaffected workers. The Pullman company refused to recognize their membership, however, and ignored a strike that began at its factory. Debs ratcheted up the pressure, calling for a nationwide boycott against any train that included a Pullman sleeper car. Within four days, 125,000 railroad workers around the country had left their post, rather than handle a Pullman railcar. The strike paralyzed commerce in the country and grew to involve nearly a quarter-of-a-million workers. Rallies boiled over into riots as strikers and strikebreakers fought, trains were derailed and buildings razed. In response, President Grover Cleveland’s administration sought and received an injunction from the courts, demanding an end to the strike. Debs and union leaders ignored the injunction, but the Government ordered troops from the US Marshals and the Army to enforce it. 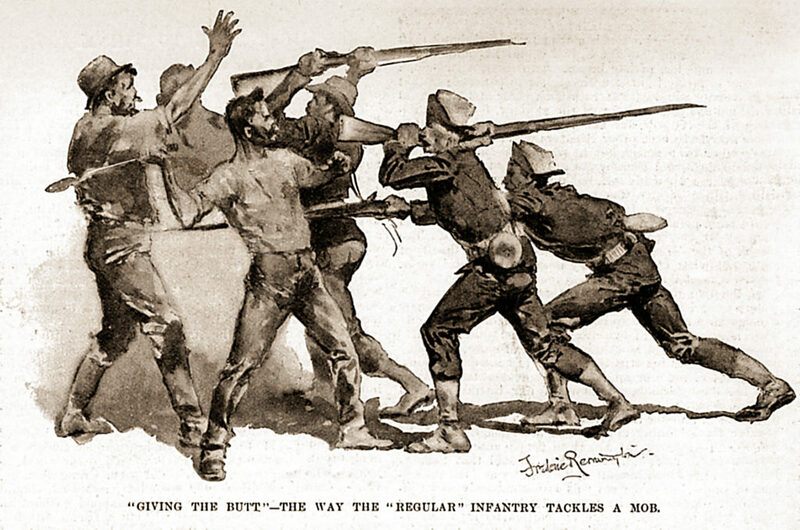 Thirty strikers were ultimately killed as the Army clashed with strikers, and Debs was convicted of violating the injunction and ultimately sentenced to six months in prison. The American Railway Union dissolved soon after. The strike was over, but it irrevocably changed both the town and the company. George Pullman died three years after the strike and the State Supreme Court soon ordered the company to sell the town. In 1889, Pullman was annexed by the city of Chicago and within ten years, the grand Victorians were all sold to their tenants. The factory was still the heart of the town for the next several decades. As the power of labor began to increase during the progressive area, the first African-American labor union was formed there in 1925—the Brotherhood of Sleeping Car Porters, comprised of black service staff that served the cars almost exclusively white clientele. As the automobile age dawned, the decline of rail eventually led the company to shutter the factory in 1955. As the neighborhood declined, calls for its demolition rose in the 1960s, until residents lobbied for landmark status to protect it. 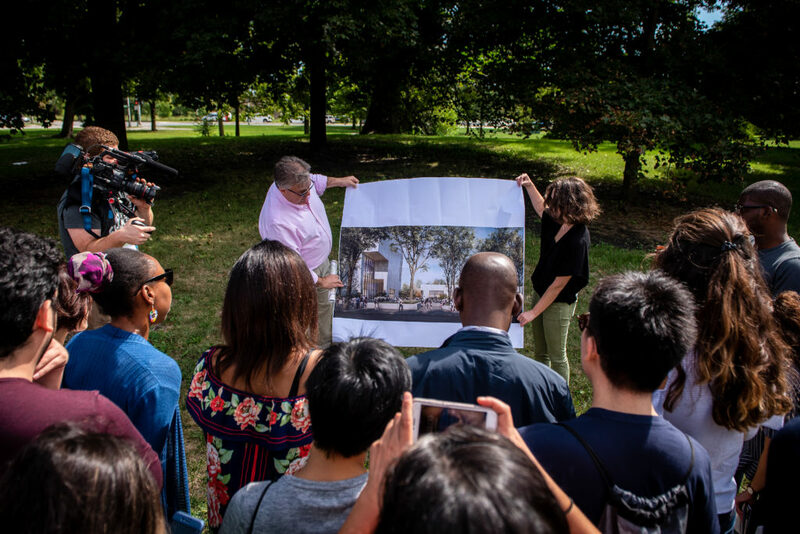 As the tour of the neighborhood ended, the Scholars walked back across Pullman’s wide lanes and through the park that formed the center of the monument. Signs of modernity punctuated the historic neighborhood—a riding mower, a bike share station. And a bit further across the street, construction was underway to restore the Factory to a fully operational visitors center for the Monument. But ultimately, Pullman still felt like a place preserved in amber. 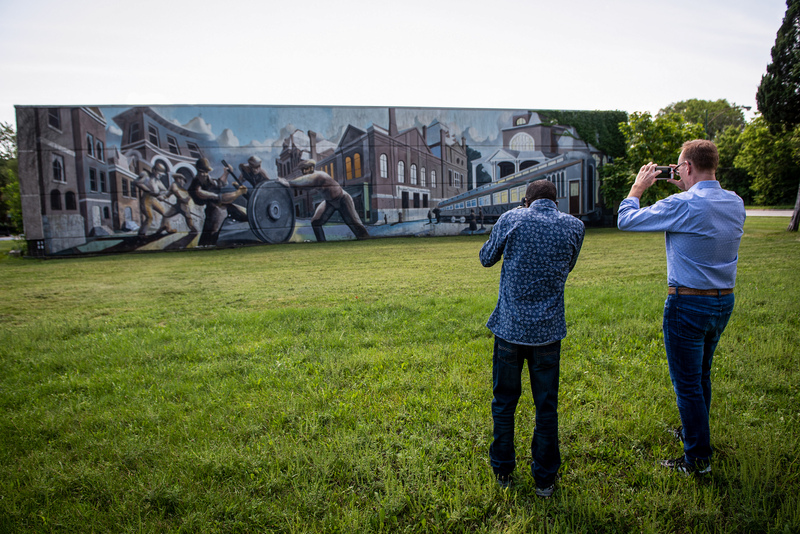 The ornate rowhouses, the Depression-era murals, the power that workers had to grind the country to a halt—it all seemed to signal an industrial American past that grows harder to recognize today. But it was time to head to Roseland, to get an appreciation for understanding for the South Side’s more recent, more resonant past. 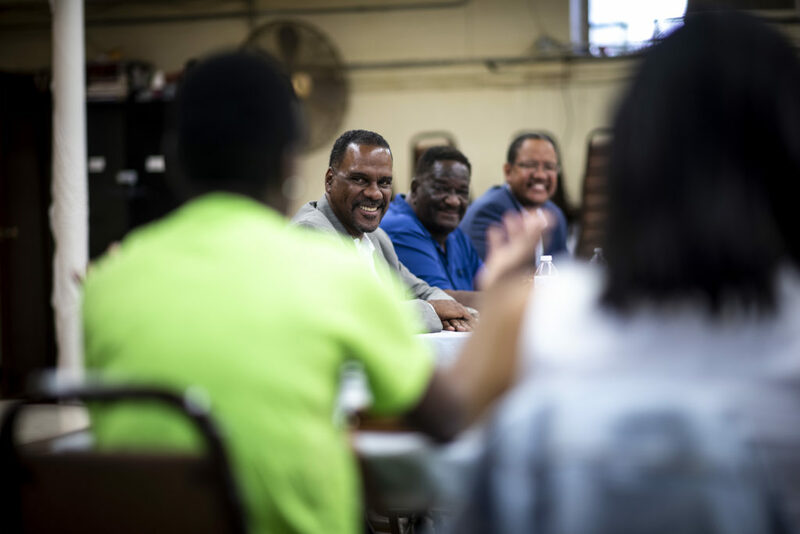 The Scholars piled slices of Beggars pizza—a local South Side favorite—onto plates and took their seats at the folding tables arranged around the room. Michael Strautmanis, Chief Engagement Officer for the Obama Foundation, stood at the head table next to Reverend Love and President Jones and introduced the men as President Obama’s mentors. “They’re also two of the most impressive community builders I have frankly ever heard of,” he said. To start, President Jones and the Reverend introduced themselves and spoke about their roots in the community of Roseland. President Jones had grown up less than a mile away, in a neighborhood called Morgan Park, before eventually coming to represent the district in the State Senate. Reverend Love was born in Chicago and spent part of his childhood in Mississippi before moving back. He became Lilydale’s tenth pastor in 1983, 69 years after the church was founded. After Reverend Love shared his anecdote of meeting a young community organizer he mistook for a beggar, President Jones spoke about his early relationship with the rising politician. President Jones obliged. He handed him an issue no other Democrats wanted to touch: campaign finance reform. But the opportunity to work on the bill allowed Barack Obama to forge important relationships with Republicans in the Illinois’ State Senate and work with them to eventually pass a bill—the first significant campaign finance reform law in Illinois in a quarter of a century. After the story, it was time for the Scholars to ask questions. A Scholar asked how leaders who may have large ambitions make sure they don’t lose touch with the people they hope to serve. How can one stay grounded while still climbing higher? Here, Reverend Love had a nice anecdote to share. “You’ve got to pick out a few folks that were with you at the start and continue that relationship,” he said. “One of the great things I admire about President Obama is that once he became President, he didn’t have to deal with the lowly pastor on 113th and Union. But he continued to call me, to send me invitations, and to ask my advice. The final question came from a place of exasperation. One of the Scholars, an emerging politician in his country, expressed frustration that more experienced leaders in his country who had served for decades would not step aside for him to rise. “Am I just knocking on the wrong door?” he asked. 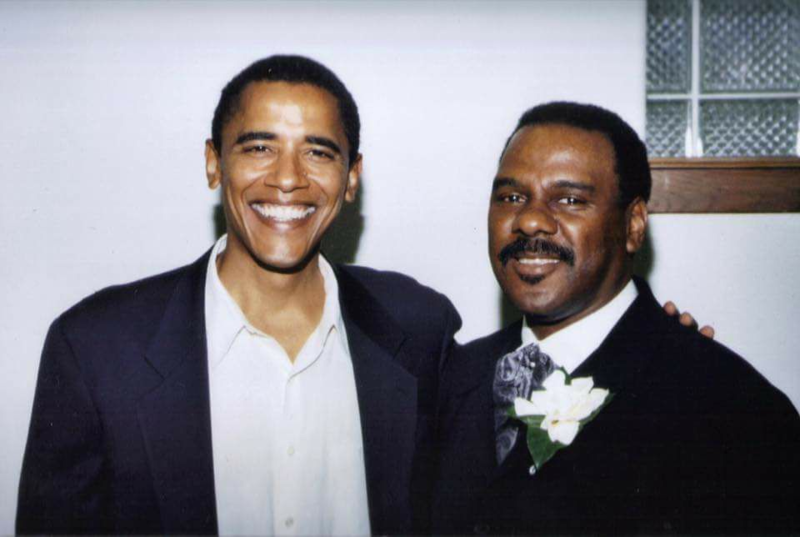 Reverend Love again recalled that day he first met Barack Obama. “Something inside me said, ‘Well, open the door and see what it is.” The Reverend described that instinct as a sense of fate, of divine providence that he and the future-President should meet. But as he explained, Barack Obama “didn’t know to come and knock on my door. He just happened to be walking through the community knocking on every door. President Jones concluded by recalling the election in 2003 that gave Democrats control of the State Senate and made him Senate President. Soon after, Barack Obama came to deliver a message. “You’re the Senate President. You’ve got a lot of power,” he told him. “Yeah, me!” Obama told him. 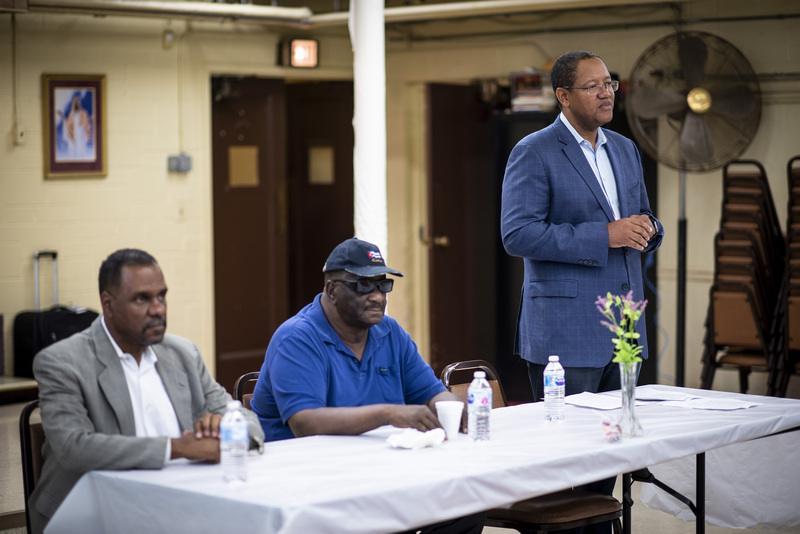 When President Jones came back to Chicago from the capitol, he began having conversations with local politicians about supporting Obama for the open Senate seat. The Scholars erupted into applause. “Unfortunately, we’ve got to end it there,” Strautmanis said, “But what a great note to end on.” Still, you could tell the Scholars wanted the conversation to go on. For a brief moment—the only moment during their South Side tour—they seemed disappointed. You can learn more about the Obama Foundation Scholars here.